This weekend, the time came to make the previously-mentioned Tomato Jelly Salad, a tomato aspic dish that is in the suggested Thanksgiving menu in the Silent Hostess cookbook from 1930. Soak the gelatin in cold water and dissolve in boiling water. 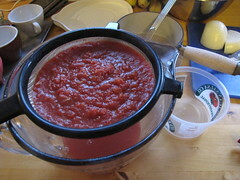 Cook the tomatoes, onions, celery seed, cloves, salt and sugar for fifteen minutes. Strain through fine strainer or cheese-cloth; add lemon juice and dissolved gelatin. This may be molded at once or it may be kept in covered jar in refrigerator Cabinet until needed. To use, take out what is wanted and melt over hot water. Suggestions for several variations follow. 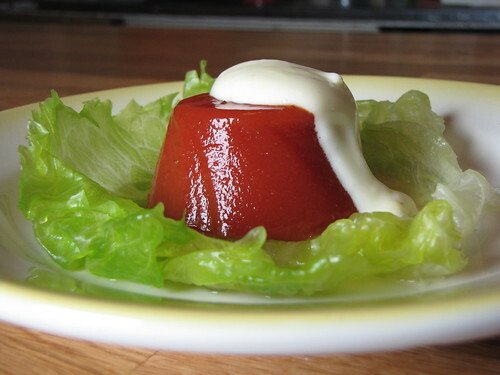 Fill individual molds which have been dipped in cold water with Tomato Aspic. Chill until firm. 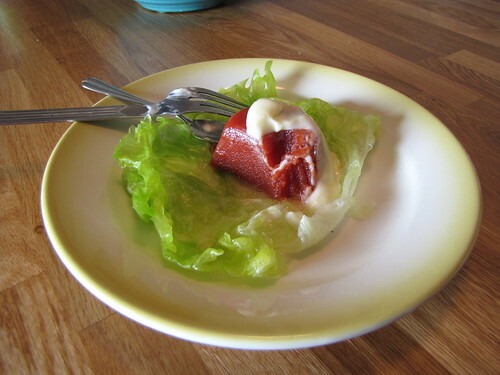 Unmold on crisp lettuce and serve with mayonnaise dressing. Beat egg yolks and add few drops of vinegar. Drop oil, drop by drop, into egg mixture until one-fourth cup is used. Then gradually increase the amount of oil added, beating constantly. As mixture thickens , add the rest of the vinegar a little at a time, Add salt. Lemon juice may be used in place of vinegar, if preferred. I got canned tomatoes, as at this time of year, it’s likely that a homemaker in 1930’s Seattle wouldn’t have access to fresh tomatoes. I thought about adding some Tabasco or something else to give it some spice, but decided it was better to follow the recipe as is for testing purposes. 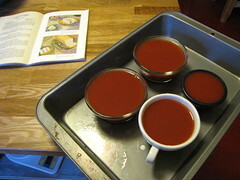 After cooking the mixture of tomatoes and spices, I drained the tomato puree, mixed the juice with gelatin, and poured it into some cups to mold. Then the cups went into the refrigerator to chill. A bit later, Kristen and I made the mayonnaise. Living dangerously, we decided to risk an uncooked egg mayo. (The eggs were, at least, organic and well-washed.) Making mayonnaise is slow (dripping the oil in, drop by drop) but the results are pretty good. The recipe above probably includes too much salt, though. I have an odd ambivalence about this. It doesn’t exactly taste bad — it tastes like V-8 or tomato juice, and I like V-8. But for some reason I don’t really want to make this or eat it again. I think it’s got to be a textural thing. V-8 is great, but gelatinous V-8? Well, I’ve never developed a taste for it. It feels odd to me. I don’t hate this, or even exactly dislike it, and the flavor is OK, as I said. It’s just not really likable. Kristen tasted it, and did not like it. Jason suggested that it might be better sliced on crackers. Perhaps. The next morning, he ate it in cubes mixed with fried egg, and said “ehhh, I probably won’t eat any more.” Jesse tried it, and his response was about the same as mine. So, the mystery remains: why did gelatin salads take US culinary habits by storm in the early 20th Century? Based on the evidence of the Tomato Jelly Salad, we can’t yet imagine why. But we will experiment further. I am an old guy. 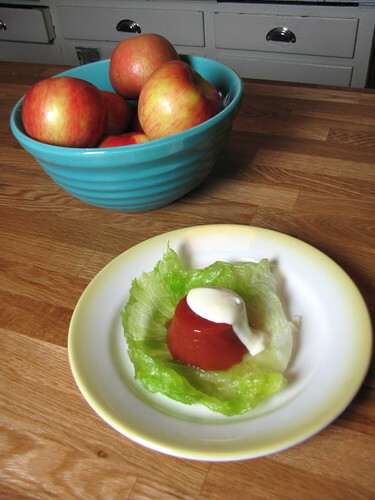 My mother (who was a terrible cook) made tomato aspic in the 1950s. She learned from her mother who started making aspic in the 30s. I always hated this stuff. So why was it popular? I think cooks (almost all of them women, then) like to be creative and aspic is sort of a creative project along the lines of crocheted hotpads. It might be useless and/or tasteless but it was handmade! 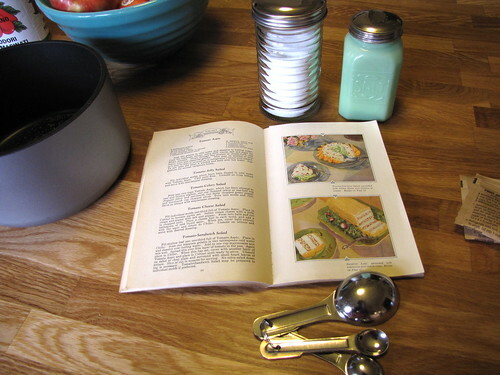 There was a lot of this kind of craft cooking in the 50s — inedible but it looked and seemed fancy. I am an old guy too, and I remember this stuff as bad at best. It was gag worthy at worst, usually with canned tuna. Maybe it needs better tomatoes, less modern. Some short jelly jars have impressed molds in thier bottom which leave an impression on the unmolded form. When they are wiped with mayo and then wiped again it stays in the desing and would have added visual delight.